Vol. 2, No. 2 The Associated Students, Inc. is in business, student government is now a non-profit business registered with the state. Mulching on campus stinks. 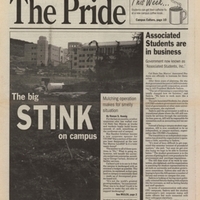 September 21, 1994,” University Archives at the CSUSM Library, accessed April 18, 2019, https://archives.csusm.edu/student-newspapers/record/91.